A multiple-response set is much like a new variable made of other variables you already have. A multiple-response set acts like a variable in some ways, but in other ways it doesn’t. You define it based on the variables you’ve already defined, but it doesn’t show up on the SPSS Variable View tab. It doesn’t even show up when you list your data on the Data View tab. But it does show up among the items you can choose from when defining graphs and tables. The following steps explain how you can define a multiple-response set, but not how you can use one — that comes later when you generate a table or a graph. Also, there are two Multiple Response menus: The one in the Data menu is for tables and graphs; the one in the Analyze menu is for using special menus that you see in this example. A multiple-response set can contain a number of variables of various types, but it must be based on two or more dichotomy variables (variables with just two values — for example, yes/no or 0/1) or two or more category variables (variables with several values — for example, country names or modes of transportation). For example, suppose you have two dichotomy variables with the value 1 defined as “no” and the value 2 defined as “yes.” You can create a multiple-response set consisting of all the cases where the answer to both is “yes,” where the answer to both is “no,” or whatever combination you want. Open the Apples and Oranges.sav dataset. Note four dichotomous variables that have 1 for Yes and 0 for No as their possible answers, as shown here. The variables are nominals with possible values of 1 and 0, which have been labeled Yes and No, respectively. Choose Analyze→Multiple Response→Define Variable Sets. Your variables appear in the Set Definition area. If you previously defined any multiple datasets, they appear in the list on the right. In the Set Definition list, select each variable you want to include in your new multiple dataset, and then click the arrow to move the selections to the Variables in Set list. In the Variable Coding area, select the Dichotomies option and specify a Counted Value of 1. Select a Set Name and (optionally) a Set Label. The new multiple-response set is created and a dollar sign ($) is placed before the name, as shown in the following figure. The dollar sign in the filename identifies the variable as a multiple-response set. The new name will appear in two special menus in the Analyze menu. The window showing the complete definition. 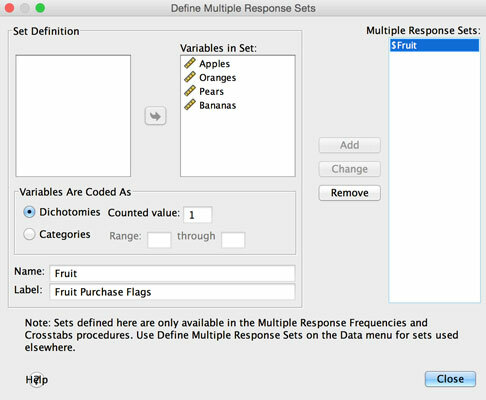 There are other applications of multiple response as well, notably in the menus of the Custom Tables module, but you have to define those multiple-response sets in the Data menu. Having two menus for declaring this variable type can be a little confusing if you don’t realize this. The new special variable should appear. 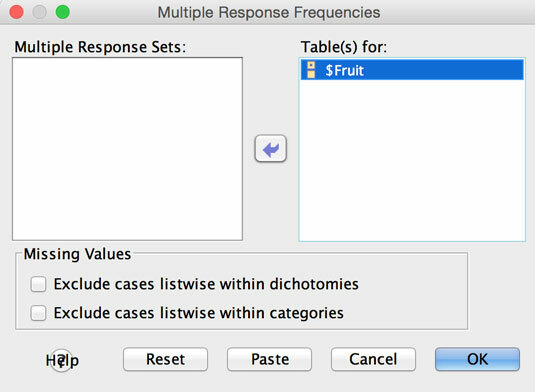 Move the $Fruit variable into the Table(s) For area, as shown. The Multiple Response Frequencies dialog box. Move the $Fruit variable into Table(s) For area. The new special Frequencies report appears in the output window, as shown here. The Multiple Response Frequencies table. This may look confusing at first, but it’s really pretty easy. Ten people bought 24 pieces of fruit. 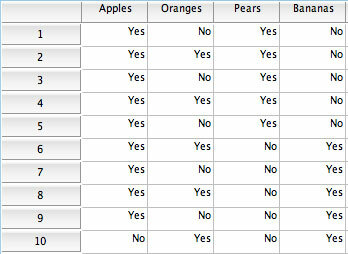 Nine pieces of fruit were apples — 37.5% of the fruit. Nine out of ten people bought apples — 90% of the people. So, the difference is the denominator. What makes this table special is that what you usually care about is the people with multiple responses. In other words, how many people shopping at the store are going to buy apples along with other things that they might buy? This table is the only one that easily displays them both ways. If multiple-response sets are a common variable type for you, you should consider trying to get the Custom Tables module because it offers lots of options for this kind of variable.